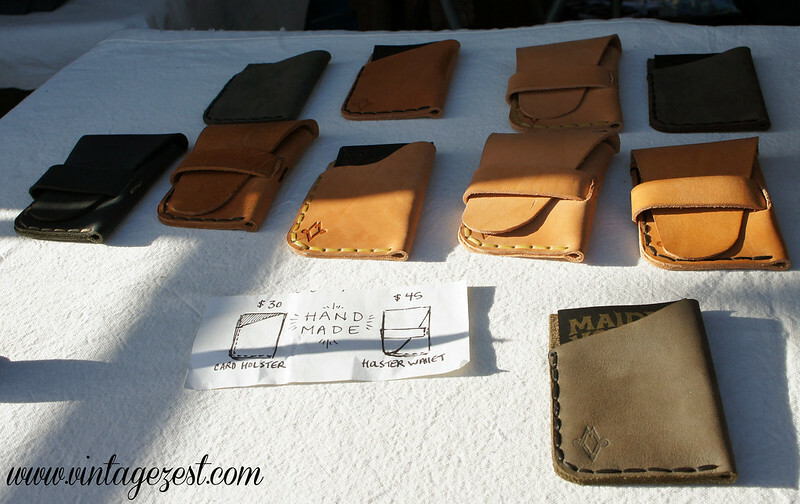 Handmade Gift Feature & GIVEAWAY from Maiden Voyage Clothing Co. ~ Diane's Vintage Zest! 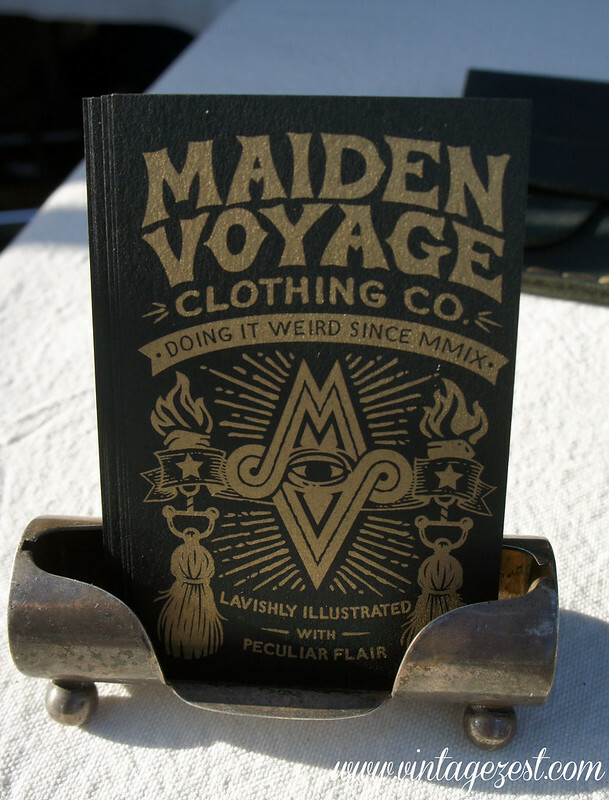 Handmade Gift Feature & GIVEAWAY from Maiden Voyage Clothing Co. The latest feature for "25 Days of Handmade Gifts" comes from Maiden Voyage Clothing Co. and I love everything about this duo! Tyson and Klara are just the sweetest and I'm so happy I had the chance to catch up with them again this Sunday at Patchwork. 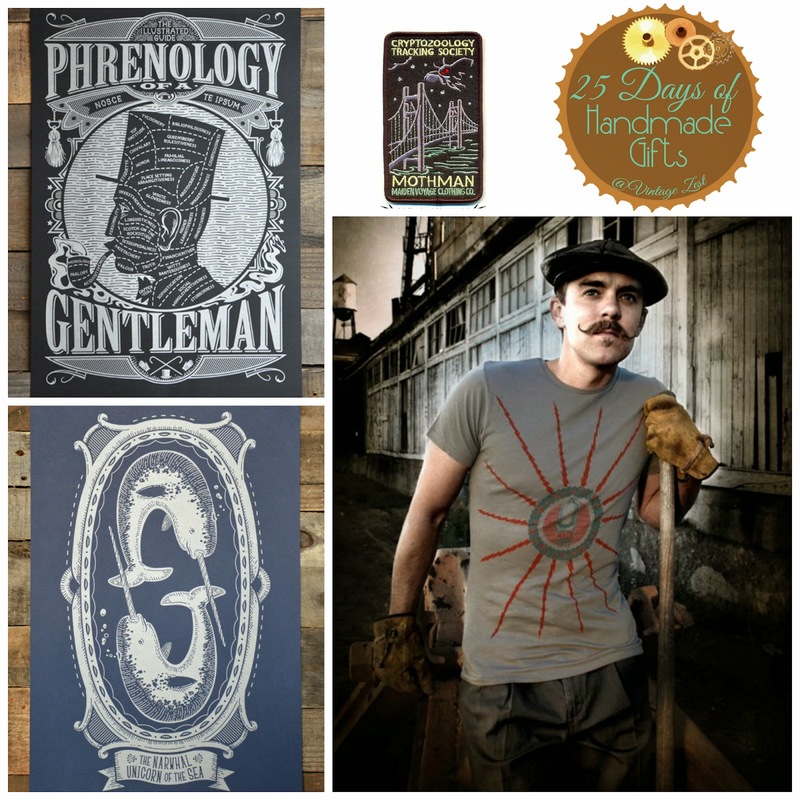 As I mentioned in the wrap-up post, their vintage-inspired illustrations are ever-so "slightly weird and wonderful." Just so you know, it's a compliment! I think you'll notice from their awesome business card below that they like a little bit of weird. 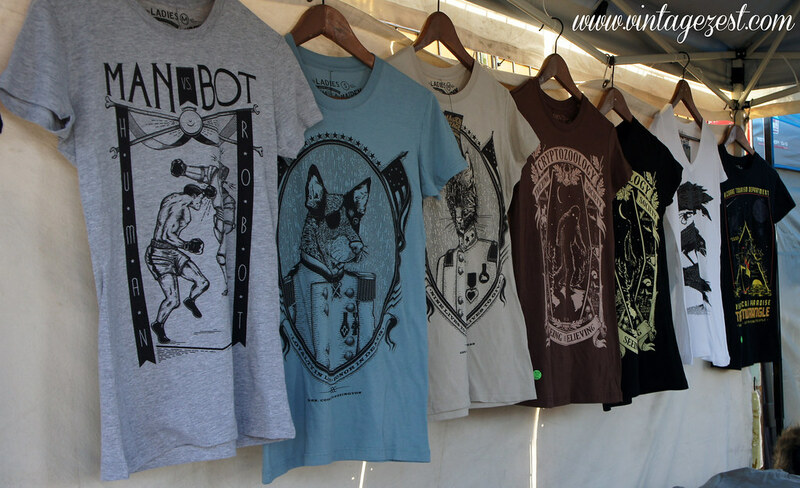 :) Anyways, the illustrated shirts would be a great gift for the man in your life, as well as the simple leather wallets. The Cryptozoology patches are so fun too! For the giveaway (!) Tyson, Klara, and their adorably named cats are offering the winner a choice of any of their illustrated posters! I am partial to the "Anatomy of a Sailor," but my two runners-up are the "Narwhal: Unicorn of the Sea" and "Phrenology of a Gentleman" posters below. There are even more awesome ones to pick from, so I'll let you decide! We're a husband and wife team. And have found that running a business beside our respective spouse is sometimes a challenge, we'll admit, but we love a challenge. Since it's just the two of us right now, we've worn just about every hat there is in the business. However, Tyson primarily does the designing and Klara primarily does the business; the rest is shared. Occasionally, our two cats, Spicket & Sprocket take on supervisory roles - which is a huge help. And of course, the Amazing Friends Team assembles to lend a hand when things get really hectic! We had decided to start a t-shirt line, but weren't sure what to call it. Simultaneously, Tyson was restoring an antique bicycle and when it was complete he exclaimed, "Let's take it on it's maiden voyage!" And at that point we had our name. Why did you start making goods for Maiden Voyage? So we could stop working for the man! 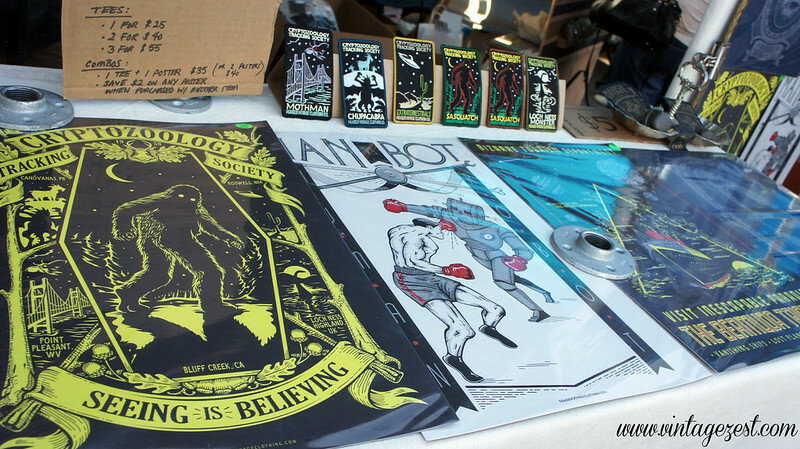 Hmm... we don't really have a favorite, but think our Cryptozoology items have brought a lot of customers' colorful stories into our lives. People share their experiences as would-be Cryptozoologists or simply their encounters or childhood memories of these lovable creatures. We don't really have a "most popular item"... people with lots of different interests seem to find something they enjoy in what we've created. We tend to lean toward topics that are weird in nature; the unexplainable, mysterious, science fiction, fantasy, folktales, legends, myths, quirky and odd are all good descriptors. Designs that can convey narrative are also very appealing to us. We really enjoy researching topics that are slated to be designed and this is where we really start to pick out the little nuances that make our designs unique. We scour flea markets, thrift stores and the internet in search of old books and articles that will help expand on our knowledge of a topic and give us the tidbits to make a design interesting and fun. And in the end, we really just want to make stuff that we enjoy (and hope others do, too). We're making things we like and our collection of creations is unique, in that it comes from our personal experiences, artistic style and preferences. There are tons of other people doing what we do, we just try to make ourselves happy with what we're doing and hope that others will find something they can take away that speaks to them. Right now our biggest challenge is finding time. We're always saying if we could just pause time and catch up it would be great! We have so many new ideas that we'd love to get to, but just can't seem to carve out the time to create them. Soon! Will you be at any other shows this year, so I can stop by and say hello? The giveaway! Just make sure to enter in the Rafflecopter widget below. It is slow to load, so please be patient or click on the "a Rafflecopter giveaway" link if you are impatient like I am! 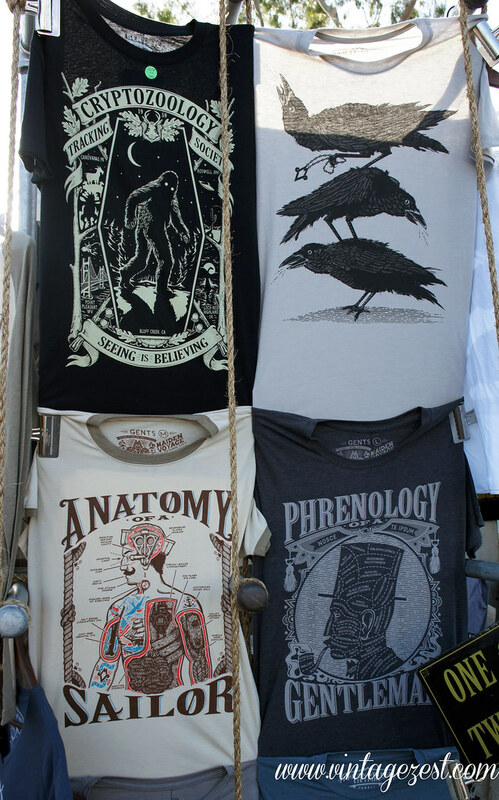 I like the Anatomy of a Sailor Tee! One of my faves! Good luck! I love their General Scooty "Foxy" tee.